Moving to a new city can present you with a whole host of changes, some of which are exciting and some of which might make you anxious. Even if you’re originally from Nottingham, you might not be familiar with all of its different areas. To help you get to grips with the new area you could be calling home, we’ve put together quick guides to some of the locations where you’re likely to find student accommodation, including Beeston, Lenton, The Lace Market and the Arboretum areas. Beeston – its name thought to come from the word bees and the name of a farm – will be most familiar to those planning on attending University of Nottingham, since part of the Park campus runs alongside this region. 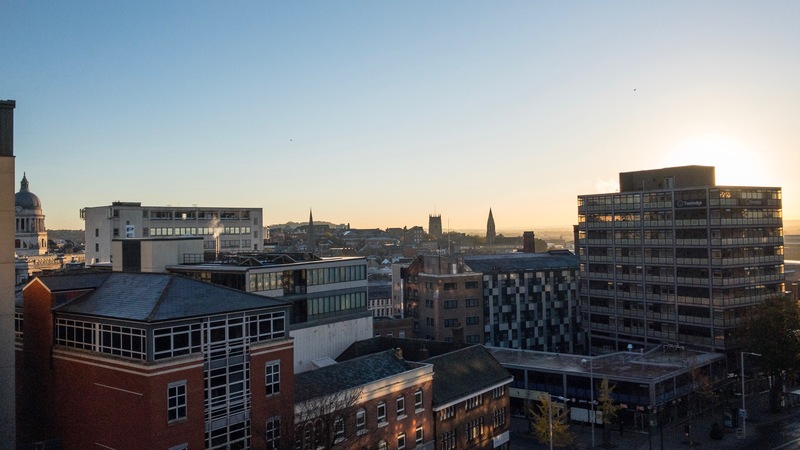 It sits south-west of the city centre and is popular with postgraduate students, as well as being a popular area in general, with house prices rising to reflect how sought after space is in this modern, peaceful location. In recent years the tram line was extended from the Nottingham train station out to Beeston, with a number of buses also running through the area. There is a PureGym, three large supermarkets, a Costa Coffee, a Caffe Nero, a Wilkos and numerous other high street stores – including local branches of major banks. The Last Post, Pottle of Blues and Bendigo Lounge are among the variety of places to wet your whistle. Future plans for the town include further development of Beeston square, with more homes, a cinema and food and drink establishments all part of the application. Work is due to begin in the spring of 2019. Taking its name from the River Leen, Lenton was once an agricultural village. Now it is mostly popular for its proximity to Queen’s Medical Centre (QMC), which operates one of Europe’s largest teaching hospitals. Sitting alongside the University of Nottingham’s Jubilee campus, this is a popular area for students and is only a short hop from the city centre via the NCT 34, 35 and 36 bus routes. The tramline also cuts through the QMC. There are several locals along the two main routes to the city centre (A6005 and A6200), as well as a large supermarket in the Castle Marina retail park. Lenton is also home to the world-famous Games Workshop HQ, producing the much loved Warhammer miniatures. Nottingham city centre features a number of key student accommodation points, but can be divided up into numerous sections. Here, we’ll take a look at two of the most popular regions for students looking for places to live – The Lace Market and the Arboretum. A truly historic section of the city, The Lace Market was once the centre of the world’s lace industry, with many buildings forming part of a protected heritage area. The tram line runs right through the area, with buses also serving Fletcher Gate and Weekday Cross roads. This area is something of a hot-spot for bars and restaurants of all varieties, from the ever-popular Annie’s Burger Shack to Pitcher & Piano. Centered around the public park – which is protected by English Heritage – the arboretum area features plenty of residential options for students. The park itself is accessible from Waverley Street or Addison Street, and features events throughout the year. The Gooseberry Bush is a popular haunt for students living in this area, while the Forest Recreation Ground is just over the hill from the arboretum area for anyone with sporty inclinations. It’s minutes from the main Trent University Campus sites, with the city centre just beyond those buildings. The tram runs directly through this region, allowing you to travel towards or further away from the city centre. Depending on where you’re due to be studying, hopefully this will give you a better idea of what each location has to offer. Nothing beats checking it out for yourself though, so take a look at our property listings on Uni2 Rent and book to view properties in these areas!